We at Flora2000 have transformed International Flower Delivery into a fine and effortless art. Want to send flowers Worldwide”? Well you are on the right page. Place an order for an elegant, cheap & stylish floral arrangement for your loved ones & you are sure to see a smile on their face. After all, flowers symbolize care and love & you really don’t need a special occasion to send them. Online flower gifting to Hungary is now just a click away. 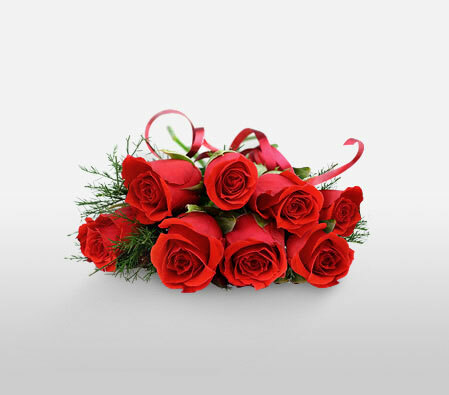 Send flowers same day to Hungary using our local florists & flower shops. Order by 12 noon. Send Easter Flower Arrangement, Easter Hampers & Gift Baskets to Hungary. Send Roses, Carnations, Lilies throughout Hungary for occasions like Birthdays, Anniversaries, Funerals, etc. Enjoy affordable flower delivery across Budapest, Debrecen, Miskolc, Szeged & nationwide delivery. Bursting with luxury and style, there is a good reason your loved one will appreciate this gorgeous bouquet of 8 bright red roses hand tied with a fancy ribbon. Approximately 9 inches W x 17 inches H.
How do i send International Flower Delivery to Hungary? Flora2000 has transformed International flower delivery to Hungary into a fine and effortless art. With our efficient flowers & gifs delivery services worldwide; you are sure to find the perfect expression of your message to your loved ones. Be it Roses, Lilies, Carnations or Cakes, our gifts are sure to make both the sender and the receiver happy. We make sure the gifts you give reflects what you feel about the receiver. We have an exclusive collection of flower arrangements, hampers & baskets for this Easter. Our classy collection of flowers & Gifts for Easter to Hungary.